In the early ‘900 Frank Benford observed that ’1’ was more frequent as first digit in his own logarithms manual. More than one hundred years later, we can use this curious finding to look for fraud on populations of data. What ‘Benford’s Law’ stands for? Nice stuff, but what can I do with Benford’s Law? Around 1938 Frank Benford, a physicist at the General Electrics research laboratories, observed that logarithmic tables were more worn within first pages: was this casual or due to an actual prevalence of numbers near 1 as first digits? That is to say that using the Benford Law is possible to make a prediction about the expected distribution of a population of data, in term of recurrence of numbers from 1 to 9 as first digits. 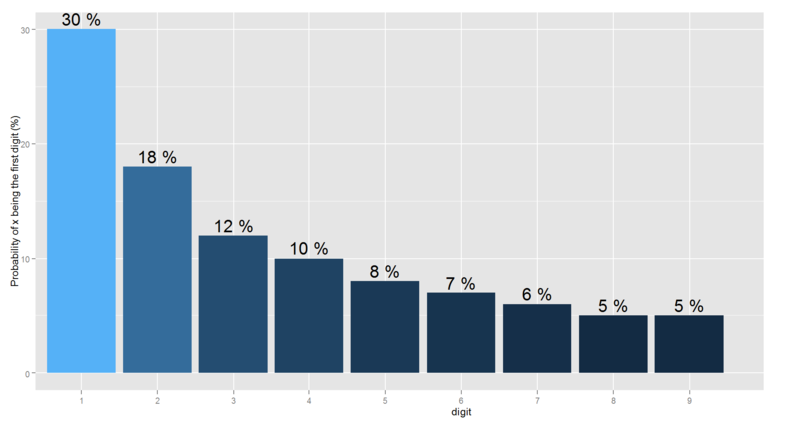 A typical “Benford Distribution” looks really left skewed, having the first two numbers nearly the 50% of probability of being the first digit. Until a certain point in mathematical history, Benford’s Law was regarded as a bizzare feature of some populations of data. Something really amusing, but not really useful. Eventually, mainly due to the meritory work of the mathematicianMark Nigrini, Benford’s law began to be used for practical purposes, and more precisely for Fraud Analytics purposes. In the case of Benford’s Law the aim of using it for catching fraud is to verify if the law is respected within the population and if not, wich elements are not respecting it. Of course, as is always the case for fraud analytics, the anomaly could be due to human error, at least for some of the anomalies ( i.e. false alarm). Nevertheless, Benford-based fraud analysis has proven to be a very effective tool for detecting fraud, especially considering the non compliance as a red-flag on the data integrity. As pointed out by Durtschi,Hillison and Pacini, you have to be cautious when using Benford’s Law. Because I am getting used to do it ( and also because my readers seems to find it useful) I developed a lean shiny app in R, that let’s you play around with Bendford law, loading your own population and looking for Benford’s law compliance ( no worry, a demo dataset is also provided). Complete, and commented, Rstudio Project is given on GitHub, but I would like to point out some code details in the following lines. BenfordeR is based on benford.analysis package, a well documented package that lets you simply perform a Benford analysis, using a single function: benford(). I approached Benford’s Law as a part of my Internal Audit job and as a part of my bachelor’s thesis. More precisely, I am currently developing a fraud-scoring algorithm that take advantage from different anomaly-detection algorithms. Walking along this path, I have further developed BenfordeR as a “module” within the fraud-scoring algorithim and the related Shiny App. The result of this development is Afraus, an unsupervised fraud detection algorithm. Find out more on Afraus reading the dedicated post.